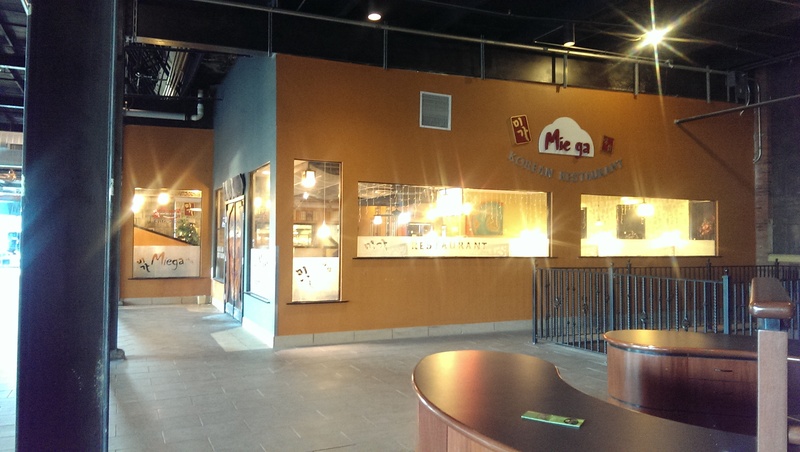 Miega Korean BBQ is located on the second floor of Asian Town Center just off E. 38th and Superior. 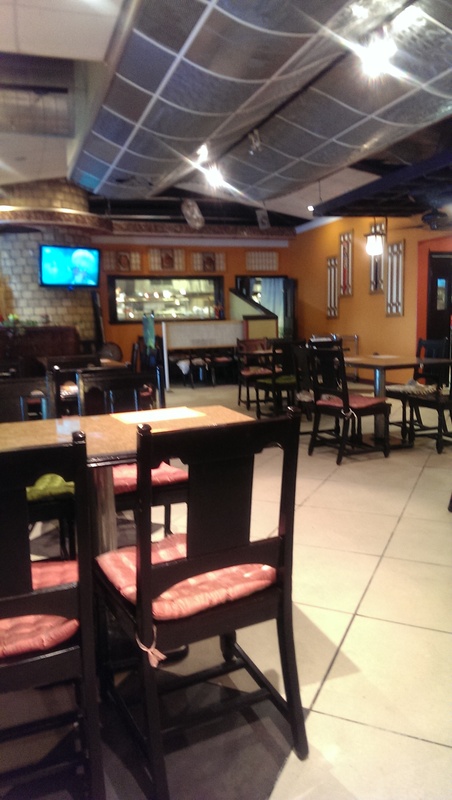 Korean BBQ is a lot of fun with a bunch of people and I plan on having my dining out group here soon, but I wanted to report on my past couple of visits by myself. I went here for supper before a recent vacation and ended up eating the leftovers on the road. 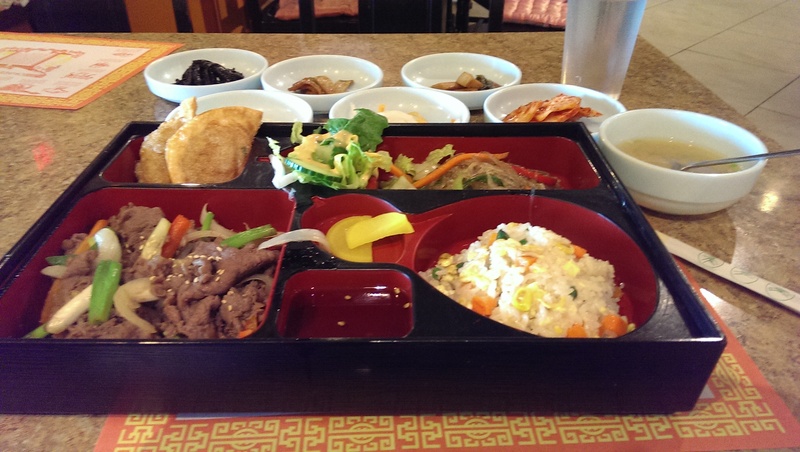 There’s always a great variety of different banchan, which fill you up even before you get your entree. 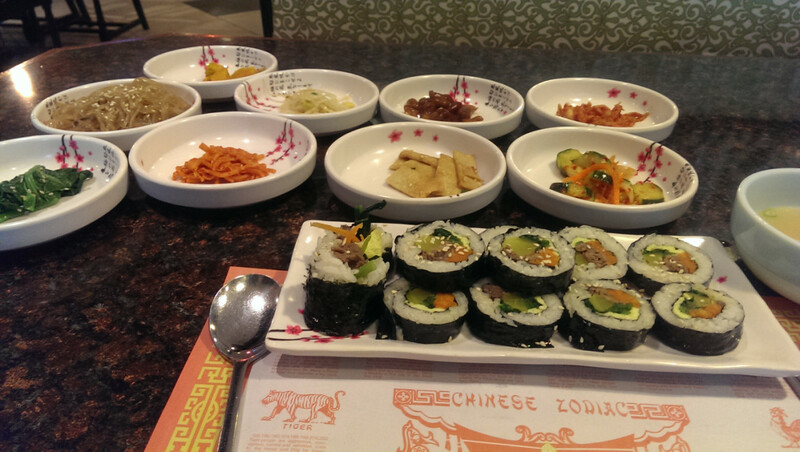 The banchan here weren’t as varied as the ones at Seoul Garden, but they were still delicious. I enjoyed sigeumchi namul (parboiled spinach dressed with sesame oil, garlic, and soy sauce), jap chae (stir fried glass noodles), sweet potato, ojingeochae muchim (dried squid), sukjunamul (marinated mung bean sprouts), rice cakes, boiled peanuts in a sauce, Kim chi, oi sobagi (cucumber kim chi), and miso soup. I enjoyed all of them, but my absolute favorite was the jap chae. The Kim bob (pictured with the banchan) were a fun take on a Korean sushi roll. It was much sweeter than Japanese sushi rolls, but I enjoyed the flavor a lot. The pickled vegetables and meat were very good together. 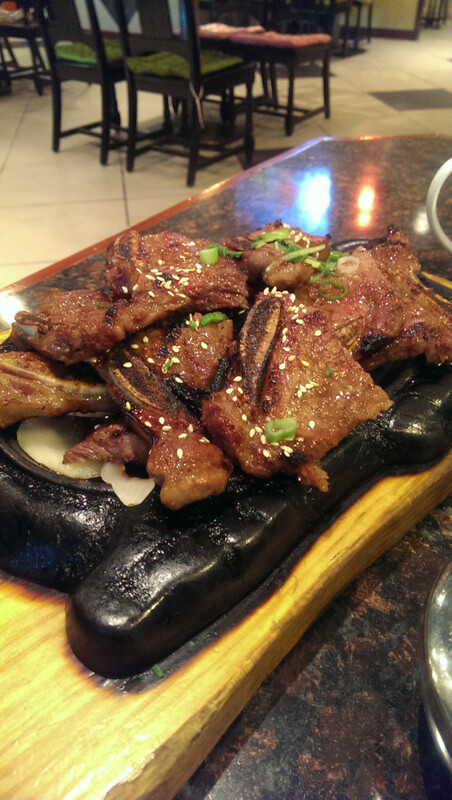 I ordered Kalbi (marinated beef spare ribs) that came out of the kitchen grilled for me. At that point I was so full that I ended up taking most of them home with me. They were good cold and reheated. 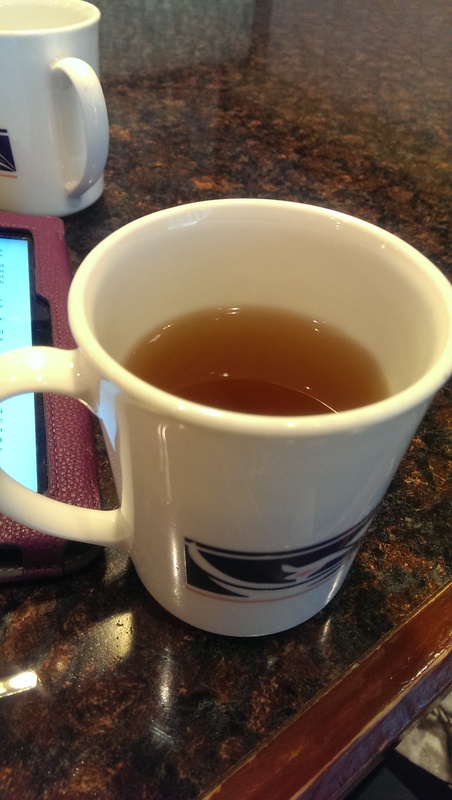 I also enjoyed the barley tea they serve and ordered a glass of plum wine based on the server’s recommendation. The plum wine was very refreshing. The bill with tax and tip ran me $39.00. Not bad for all that food. 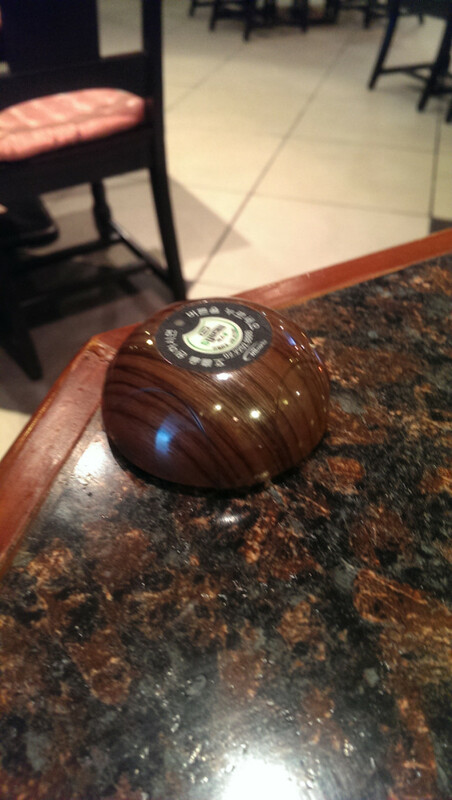 Some of the tables have a bell on them to ring for your server. This is a great little feature, and the Korean people do not think it is rude at all. I also reall y liked the metal chopsticks. They were definitely much fancier than anything you get at a Chinese restaurant. Most Korean chopsticks are metal. 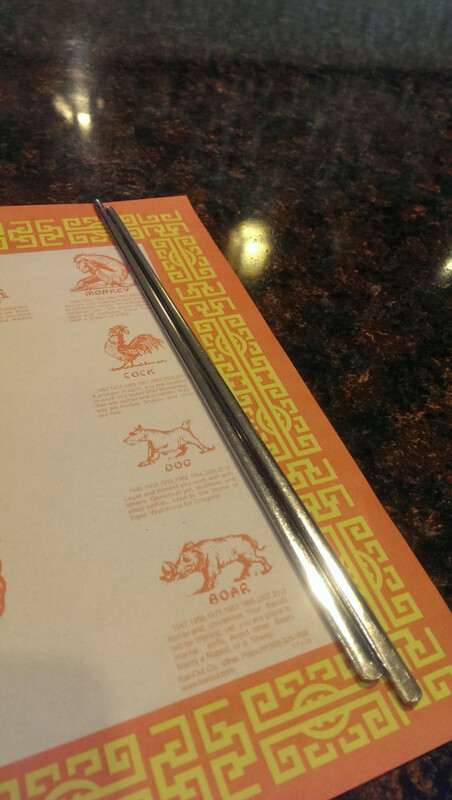 Unless you are there for lunch, then you get the wooden disposable chopsticks. Lunch is a great deal here at Miega. You can order a lunch box featuring one of their six entrees and it comes with fried rice, jap chae, salad, two fried dumplings and the ever-present banchan. I ordered the bulgogi, which was nicely prepared, thinly shaved, with some nice vegetables, and in a light marinade. The fried rice was nice and warm, with fluffy chunks of scrambled egg and fresh vegetables. I loved the Gun Man Du (the Korean dumplings). They were crispy with some kind of meat filling. I would definitely order those again! I was extremely pleased with my lunch here and was not able to finish it completely. Although the web site specified that the lunch box was $10.95, they charged me $12.95, so do not rely on the website for recent prices. It was still cheap though; my bill was $13.99 ($17 with tip). A fun spot. However, I do prefer Seoul Garden in Parma.